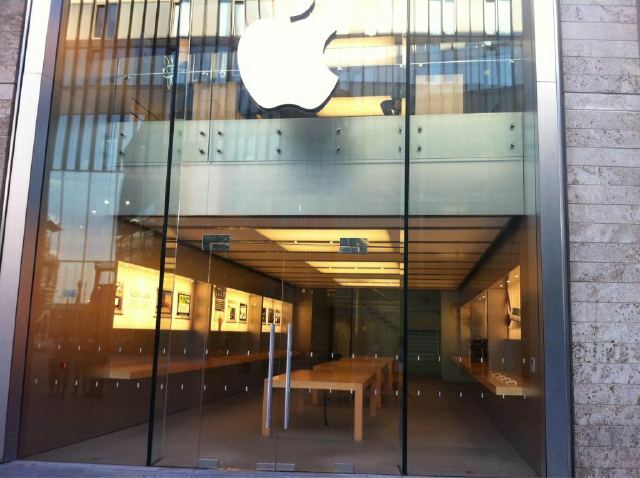 The ongoing riots and looting in various locations throughout the UK are causing some Apple Stores to take no chances. Twitter user Terry Allen shot a couple of images of the Liverpool ONE Apple Store which had emptied its shelvs of inventory and moved them upstairs to prevent looting. In addition, the Regent Street store in London is being guarded by police and the Canterbury, Kent store is also empty. The store, which normally looks something like the image below, is located on the ground floor of the Liverpool One Shopping Centre, which is on Paradise Street in Liverpool. In addition, the Apple Store on Regent St. is being guarded by police fearing looters. Not taking any chances, this Canterbury, Kent Apple Store Apple reseller has also cleared its shelves of inventory. Thanks Paul! Twitter user PB mentions that the Manchester Arndale store has also been emptied out in preparation for possible looting. If there are any UK residents out there that have images or information about the state of Apple Stores nearby, let us know by email or Twitter.